Even though we’re still working to finish up our current school year, it’s time to start looking ahead to next year. Actually, with Emma heading into the 8th grade, I’m looking ahead through high school. I need to know what our end goal is so I can map out a plan. Right now, I’m looking at our 8th grade electives. This year, we are finishing up our music appreciation book, and I want to do art appreciation next year. There are also a few topics Emma has asked to cover, as well as a short list of things I think she needs to cover before she’s officially in high school. As I mentioned, we’ll kick off our school year with this Famous Artists Online Unit Study. Emma really enjoys the independence of working online. So, I’ll let her work her way through this course at her own pace. She’s done a lot of art (painting, chalks, pottery, etc) on her own, but we haven’t studies artists in depth. This is one topic I want to expose her to before high school. 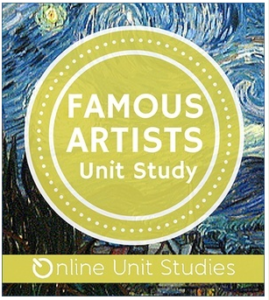 This online unit study covers ten famous artists and their artwork. The online unit study is full of links to reading selections and videos. In addition to learning about the artist, she’ll learn about their artwork and the art movement they worked in (realism, pointillism, etc.) Then, kids are given the opportunity to create artwork of their own based on what they’ve been studying. I, for one, am excited about projects like recreating Monet’s water lilies. Emma, on the other hand, is excited about creating a Mona Lisa Parody! Right now, the Famous Artists Unit Study is available in the Fine Arts Bundle in this year’s Build Your Bundle Sale. Next, we’ll study nutrition with this Learning About Nutrition study written by Amy Blevins. . Emma does not eat vegetables. There are only a few fruits she likes. She’s got a sweet tooth bigger than herself. While she’s not necessarily unhealthy, I know that she could definitely benefit from eating healthier. We all could, right? But, there’s something quite off-putting by mom nagging about more fruits and veggies and less sugar. My hope is that by really studying nutrition and what our bodies need (and don’t need), she will see for herself what a balanced diet looks like and how it will benefit her overall health. She loves coloring, and I’m sure she’ll love adding these coloring pages to her health notebook. Speaking of notebook, she loves notebooking, as well. She likes being able to record what she’s learned on notebooking pages that we can then add to her portfolio throughout the year. I like that I can use them to evaluate what she’s retaining without always needing to give a test. 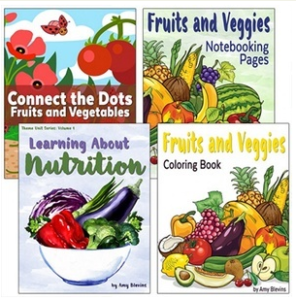 The Learning About Nutrition unit study is part of the Unit Studies #1 Bundle in this year’s Build Your Bundle Sale. Throughout the year, Emma and I will work through this How to Start Your Own Business guide. It is her heart’s desire to start her own business selling gourmet dog treats. She and her bestie create dog treats on the weekends and sell them to our neighbors. But, that’s just the beginning. They have already designed business cards and have an account set up on Instagram to share their creations. This course will take her from conception to setup! It teaches kids about marketing and record keeping, advertising and communicating with clients .There are pages that teach kids how to track their time, manage their to-do lists, and even talks to them about taxes. I love that there is a parent’s guide for this course. This will allow me to guide the conversation and the lessons as Emma works through the course. She’s super excited to get started on this! Right now, you can find the How to Start Your Own Business course in the Upper Grades #1 Bundle in this year’s Build Your Bundle Sale. The rest of the year will be spent on home ec. Emma asked for this specifically. Her definition of home ec is baking/cooking. We’ll do quite a bit of that. But, we’ll also add in life skills. I haven’t finalized my list of life skill topics, but they will certainly include sewing buttons and simple clothing repair and balancing a check book/bank statement. As she gets older, of course, I’ll add things like checking fluids in the car. For now, though, we’ll stick with things a 13yo has a need to know. She’ll also be taking another pottery class at co-op. This will be her third year of pottery, and it is one class she begs for year after year. What electives will your middle schoolers be doing next year? I’ve been debating the Online Study. We’re about to use the Memorial Day Study, so this may be the way we go. Would love to hear a review of it. I’ll try to remember to write a review when we finish it. I think nutrition is a great idea for an elective in middle school. So many teenagers won’t listen to what their parents tell them about nutrition, but studying might be different. Thanks for sharing at the Blogger’s Pit Stop. Very interesting electives. Like the one about starting a business. Important skills to learn at a young age. Thanks for linking up with Funtastic Friday. Hi Tara, My son is starting middle school next year. I really like the start your business elective. It sounds like fun. Thanks for sharing at Mom-to-Mom Mondays.